In the beginning of the new millennium Trigun was hailed as the newest coolest thing to come from Japan. It had action, comedy and interesting characters. It also had a Western feel to it – from the English names of the characters to the Wild West oriented world it took place in. In a way Trigun was like a new locomotive. It was shiny and good looking, worked smoothly and delivered a good ride just as promised. Much time has passed since then. Have the years been kind to this attractive series, or should it retire to the scrapyard in favor of newer anime titles? On a desolated desert planet people live from hand to mouth. It is a wild environment filled with armed robbers, ruthless criminals and gangs. But the most infamous of all criminals is Vash the stampede. Vash is supposedly to most corrupt, dangerous criminal out there, and he leaves ruin and destruction wherever he goes. 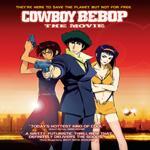 Two brave insurance girls are sent on a mission to locate the legendary Vash and keep him under control to minimize the damages he causes. However they soon find out that Vash is a peace-keeping love-promoting goofball who has a neck for getting into trouble despite himself. On top of that strange assassins called the Gung-Ho Guns keep trying to kill Vash with no reserve for the people around him. But just who is the mysterious Vash, a gunman so dangerous he is rumored to have single-handedly destroyed an entire city? As the fights grow more and more desperate Vash if forced to reveal his true identity and confront his dark past. Let’s not beat around the bush. There are plenty of important aspects this review will cover, but unlike other reviews I believe this one should start with the visual quality of this aging title. Visually Trigun is suffers from almost all the ills out there – grain, pixilation, white spots, aliasing (jagged lines), scenes where the images are shaky, you name it. It was necessary to get this fact out of the way at this early point in the review because you will notice all of these visual oddities the moment you press the play button and are presented with the first episode. Trigun is an old title that was never retouched, and it shows. Should this deter you from watching it? The answer is a resounding no. Although it looks dated it still has an appealing look. It takes time to get used to the old visuals, but the show itself is far from being ugly. The colors are vibrant, the animation is fluid, and after some time the atmosphere sinks in and all the visual oddities are forgotten. While Trigun lost some of its visual fidelity to the sands of time it retained a lot of things that made it a hit back in the days. Vash the stampede, the series’ main protagonist, is as funny as he is mysterious. As a lead character he does a great job at entertaining you with his comical antics while at the same time remains shrouded in mystery, which gives him an edgy and foreign feel. Vash’s character is always evolving and you will be transfixed to the screen every episode to check just how much difference his presence alone can make in the lives of the denizens of the dry desert planet. Vash is accompanied by Meryl Stryfe and Milly Thompson – two ladies who work for an insurance firm that pays for damages caused by Vash. Since the presence of Vash always causes troubles and destruction, so much so that he is infamously known as “the humanoid typhon”, Meryl and Milly were ordered to keep him under control and away from causing any harm. Although they can be shallow at times due to their transfixed mission, both girls are heart-warming. Just like Vash, most of the characters in Trigun have contradicting personalities. The insurance girls are no different. Meryl has a slender feminine look but is hot-headed and tomboyish, while Milly has the build of a bulky muscular man but can be very emotional and maternal. Along the way a third character, Nicholas D. Wolfwood, joins the fry. Wolfwood, like Vash, is a comical character with a mysterious past. He is a priest, but is never shy of using his profession to collect money or charm the ladies. Wolfwood and the insurance girls react to Vash’s crazy lifestyle and change their own way of life over time in a convincing and gradual order. Most of the other characters in the series, however, receive much less attention. The first part of the series focus on individual episodes and doesn’t present you with “juicy characters” worth knowing. On the other hand, the second half of the series feature the Gung-Ho Guns – highly trained specialist sent to kill (or psychologically hurt) Vash. These bad guys have various skills and give Vash a run for his money. But more than that, they seem to have interesting backgrounds. Sadly most of them are disposed of before we get the chance to get to know them. One episode, for example, shoved no less than three Gung-Ho Guns at us at the same time, leaving very little time for us to see, hear or care about them. This is especially misfortunate considering that the Trigun manga did take the time to tell the stories of some Gung-Ho Guns. None of these stories made it into the anime. Fortunately Vash’s ultimate rival Knives is a superb example of how natural villains should be designed. He is crooked, emotional, and has personality to spare. Describing the story and progression of Trigun can be misleading. This show can be repetitive when it comes to narrative. The formula usually revolves around Vash arriving to a new city, discovering that some outlaws are terrorizing it and then proceeding to defeat them and save the town. The town itself may or may not be wrecked in the process. While this sounds lackluster on paper Trigun does an outstanding job at depicting this routine. Every episode has its charms and its unique take on the formula. Vash is usually cornered, and yet always manage to pull a clever stunt, prove his prowess and come on top in the end. Moreover, the series delivers memorable lines that can literally make your day. Lines like “I’ve always had the suspicions that you are no mere mortal but I never imagined you were actually…a cat”. 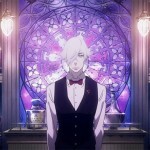 The series’ ability to take such a repetitive formula and make it fresh and enjoyable every time is short of brilliant. You’ll find yourself thinking that most of these episodes could easily be regarded as fillers, and yet they are so entertaining that you will always be happy to watch another one or two. In fact my favorite episode in the whole series is episode 19 – Hang Fire, which by all accounts can be considered one such filler episode. These routine episodes are only interrupted by a couple of plot-heavy episodes which explore Vash’s dark past. These are hit or miss episodes. Although they should be serious, shocking and emotional, some of them don’t have the impact they should have had. I found episode 17 – Rem Saverem – to be the worst episode in the series, despite being an important episode for the overall plot. I know that episode 17 should have been a shocking sad episode, but it fails completely at conveying what it so desperately tries to. Other emotional episodes vary in this account, but usually do a good job and are much more convincing. Trigun’s final episode is the icing on the cake. Taking both the action and emotional elements to their highest potential, it delivers one of the best final episodes in anime history. 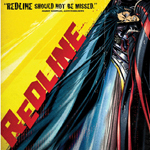 For this review I watched the FUNimation release. This release contains four DVDs packed in two slim DVD cases. These DVD cases are in turn packed inside a nice art sleeve. I love the way FUNimation packed this release! Albeit being irreversible the sleeve has a picture on its inside. The DVD cases were cleverly designed to look like movie posters, complete with eye-catching footage and promotional lines like “with a lethal appearance by the Gung-Ho Guns” or “with the hot-headed pistoleer Meryl Stryfe”. The DVDs themselves were designed to look like bullets inside a revolving gun cylinder. These are all nice touches which add to the overall experience. The DVDs come with a simple, yet functional, menu. Trigun’s only extras come in the form of textless opening and ending themes. You’d have thunk that in the many years that have passed since its initial release in Japan (and former popular release in the West) some extras might have surfaces, but sadly that is not the case. The DVDs are in SD quality with an aspect ratio of 4:3, but I watched them upscaled to 720p. As mentioned above picture quality is not the strong side of this release, but is something that you get used to over time, and does not damage the overall impression of the series. In the audio department the DVDs have English and Japanese, both of which are in 5.1 Dolby Surround Sound. The English dub is very good. Johnny Yong Bosch in particular does an amazing job as Vash. He manages to stay close to the original role while adding a lot of personality to this vital character. In contrast, the Japanese dub is below average. For some reason the Japanese cast tried really hard to sound like tough Wild West cowboys. This usually backfires, with most of the characters just sounding like common street punks or plain ignorant fools. The subtitles follow the Japanese audio perfectly, and you have two subtitle formats to choose from – one for the dialog and signs and the other for signs only. Bear in mind that since all of the signs in Trigun were written in English to begin with the sign-only subtitles were redundant from the start. If you are not the purist type who insists on watching anime in Japanese I strongly suggest that you watch Trigun in English. It is hands down the better choice. Trigun is a prime example of an anime classic. It has aged, but did so gracefully. All the plot elements and execution stunts that made the series interesting eleven years ago are still strong today. Likewise, the small things that hindered it from being even better are also still there. 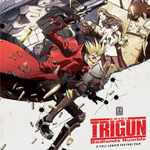 Trigun is an old classic that deserves a place on your shelf even today. Because if it survived for so many years without losing its charms than it will no doubt stay relevant for many more years to come. This old locomotive can still offer a smooth ride in style, and does not fall behind all the newer trains around. – Addictive and fun to watch. – Picture quality suffers from old age. – The Gung-Ho Guns aren’t given enough background story. 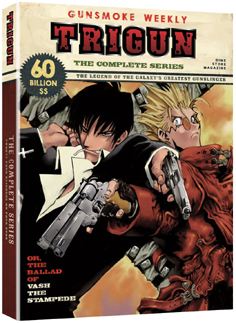 Product Information: Trigun: The Complete Series DVD. 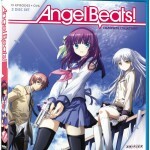 Published by FUNimation Entertainment. Release date: October 26, 2010.
Review Equipment: Samsung 32-Inch LCD HDTV (LA32B530) connected to a Premier DVX131 DVD player using an HDMI cable.